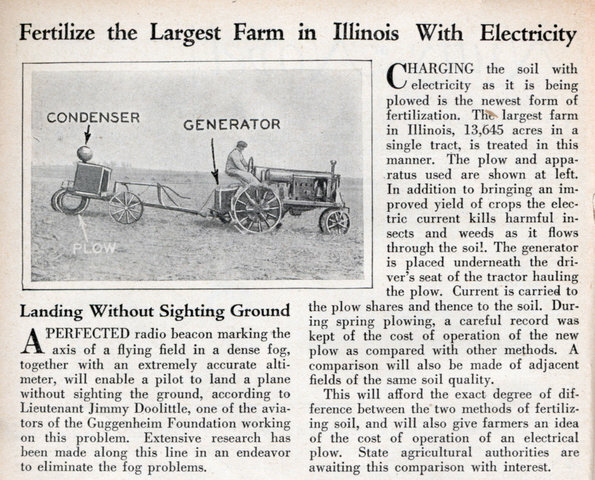 CHARGING the soil with electricity as it is being plowed is the newest form of fertilization. The largest farm in Illinois, 13,645 acres in a single tract, is treated in this manner. The plow and apparatus used are shown at left. In addition to bringing an improved yield of crops the electric current kills harmful insects and weeds as it flows through the soil. The generator is placed underneath the driver’s seat of the tractor hauling the plow. Current is carried to the plow shares and thence to the soil. 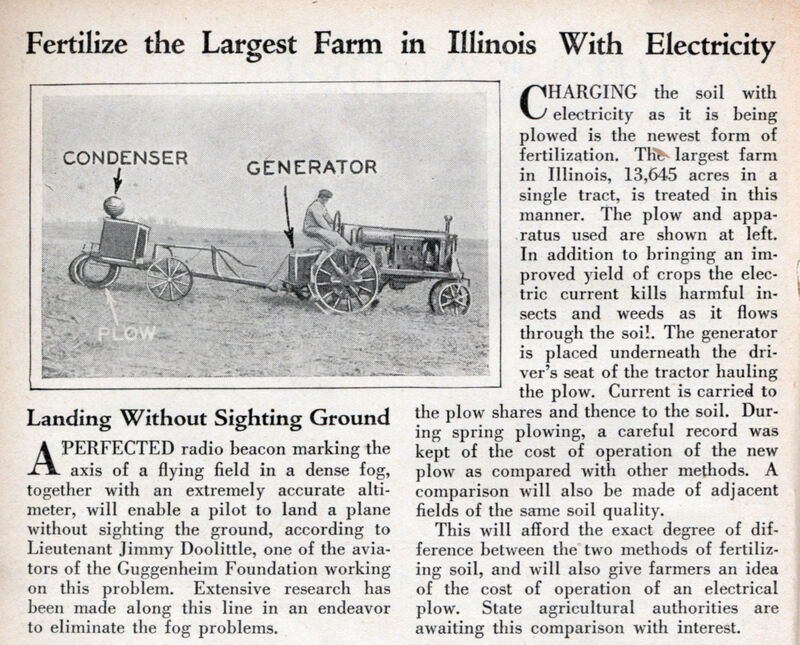 During spring plowing, a careful record was kept of the cost of operation of the new plow as compared with other methods. A comparison will also be made of adjacent fields of the same soil quality. This will afford the exact degree of difference between the two methods of fertilizing soil, and will also give farmers an idea of the cost of operation of an electrical plow. State agricultural authorities are awaiting this comparison with interest. I’m more impressed with the other article…..Lieutenant Jimmy Doolittle….Died in 1993 after retiring as a General and that after winning the Medal of Honor in WW2 for planning and leading the Doolittle Raid against Japan in the wake of Pearl Harbor. 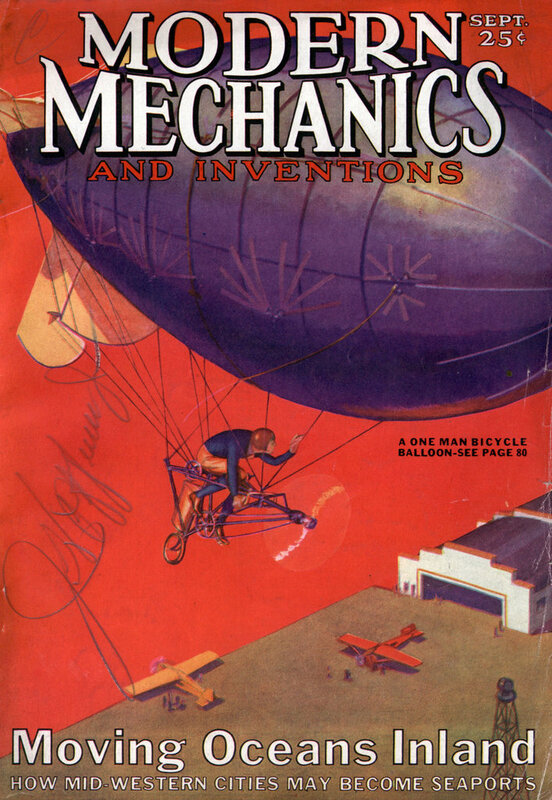 In 1929 he solved the problem he describes and became the first pilot to take off, fly and land on instruments alone. Electric fertilizer is bunk, however. I fertilize my field by pointing my Fleury DEATH RAY (Pat. Pending) at it and in just 6-7 months I have tall, healthy plants! I live in a village and work in agriculturing. We use fertilizers and i try to read everything about them.